The weather girl predicted good weather for the weekend, and it certainly has been. The sunshine came out and decided to hang around for a long while. Yesterday we went to a Country Park in the South West of Scotland, and today, we've been busy working in the garden plot. I'll tell you more about them both during the week, otherwise this entry will be way, way too long. For now may I share with you these home made vegan sausages, which we had for our brunch. I am so glad I made them in advance as after the gardening, weeding and digging my back is feeling a little sore and now all I want to do is sit down and rest, maybe even have a long bath. These olive and sun dried sausages don’t look the prettiest in their raw state. Even the flecks of red and black don't make them look particularly inviting, but once cooked, they were transformed and became rather appealing. 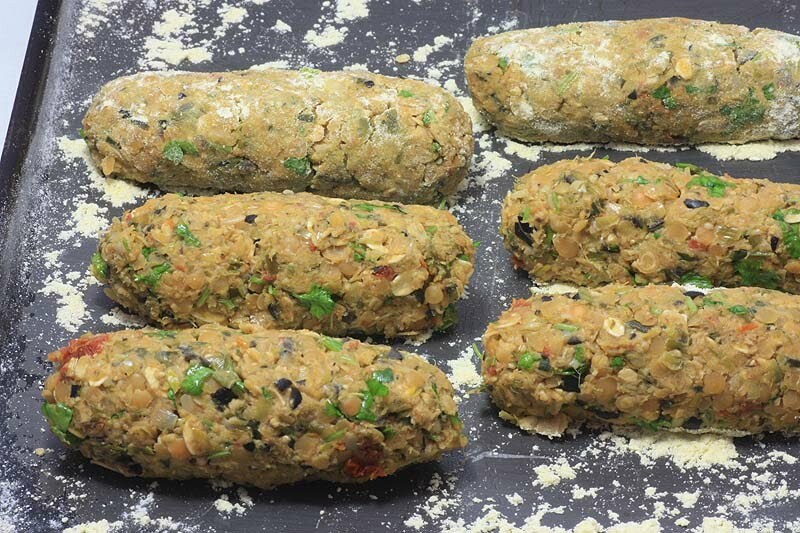 These were substantial like good Glamorgan sausages and packed with flavours from the olives and sun dried tomatoes. D said it reminded him of vegetarian haggis, but I completely disagree. I think in his head he was making this equation because of the generous amount of oats. I would recommend making these the day before and allowing to chill in the fridge overnight, so the oats can swell. Also the mixture is quite soft and wasn’t particularly easy to roll into sausage shapes, so another idea would be to turn them into patties if you so wish. Or if your feeling more adventurous, perhaps using the filling for individual pies. These vegan sausages were fab for breakfast or brunch, but I don’t think there would be any harm having them in the evening either. I'll be doing that one of these coming evenings, as we have another four left to enjoy. Preheat oven to Gas mark 6. Cook the red lentils with the stock until soft. My lentils absorbed all the stock, but if yours doesn’t drain and set aside. Roast the olives, leeks garlic and sage leaves in the olive oil for 20 minutes of until soft. Blend the roasted vegetables, mint and the sun dried tomatoes in a food processor to form a rough paste consistency. Place the oatmeal and oats on a baking tray in the pre-heated oven and toast for 7 minutes until golden. Mix together the roasted vegetables, cooked red lentils and toasted oat. Season well. Shape into 8 sausages. Lightly rolling cornmeal and chill in the fridge. Shallow fry in sunflower oil until crisp and lightly browned. Serve as part of a veggie breakfast or with mash and gravy. Adapted from Demuths Green Seasons. WOW! THese look so delicious! Thank you for the recipe! Anyway, my point is that these look awesome! I love that you put mint in them, and what a great idea to use lentils in them; it sounds wonderful with the black olives and s/d tomatoes. I'll be trying these soon. Thank you again to Demuths! I agree there certainly are. Oh thank you for this post! I can't wait to try these. I am vegetarian and slowly going vegan. These sound so good. Waw!! 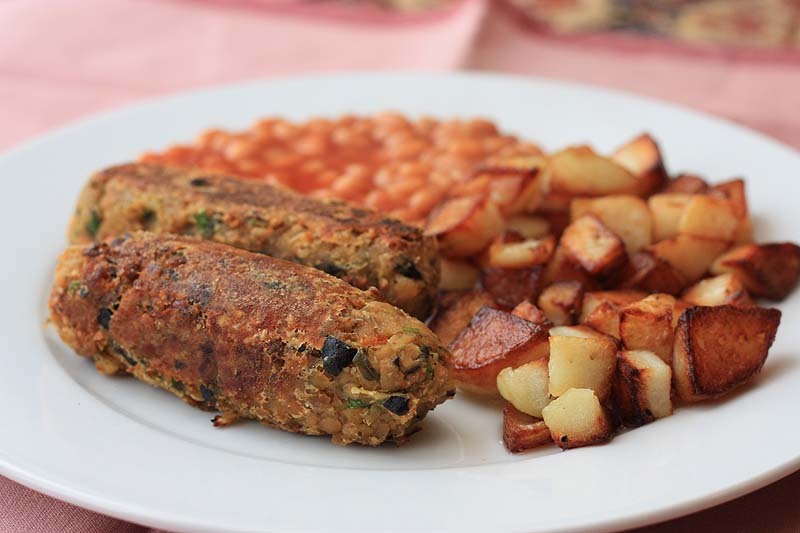 These lentils &veggie sausages do look so tasty & luscious! Now, I would like to taste them even that it is breakfast time! just the sort of sausages I love - and making them the night before sounds quite sensible - because I love the idea of waking up and popping them in the pan! I just printed your recipe up and hope to make them this week - they look fantastic! Funny, I've made various types of veggie burgers but never even thought about making sausages. Can't wait to try these. I do hope you enjoy them. I look forward to reading how your vegetarian to vegan transition goes. Warmest of wishes. They are good, just please please make them the evening before, so that they can firm up. I do hope when you make them you enjoy them as much as I did. Yeah your right Johanna, making them a day or two before makes perfect sense. Afterall the last thing I would want to do is make them from scratch early in the day. I do sincerely hope you enjoy these. You must let me know how you found them. 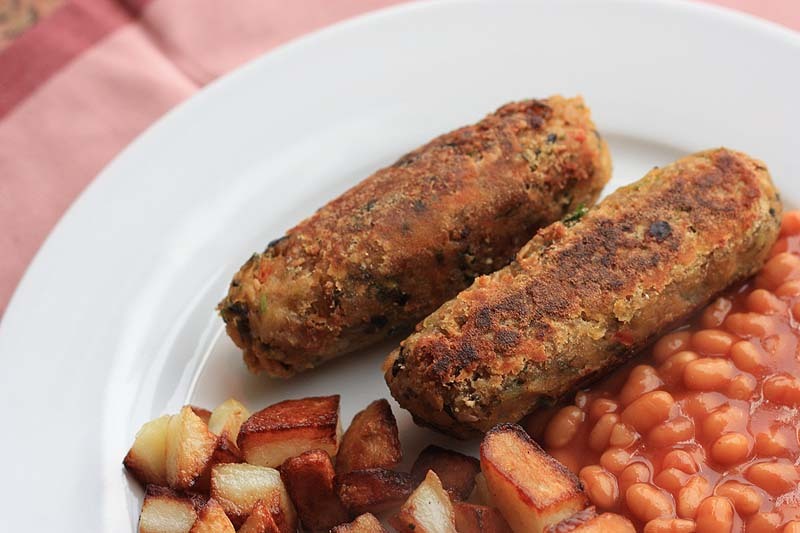 Lentils in veggie sausages - brilliant idea. And they look wonderful to boot. Another one that goes into my recipe file! I just made a variant on these after being inspired by your post - they were great! Oh Lysy Thank you so much for coming by and letting me know. I always love to hear from fellow bloggers if they've seen something on my blog to inspire them, because its a 'real compliment'. Thank you So, So much!